Orgain is the world’s first ready-to-drink certified organic meal replacement made from only the highest quality ingredients. Loaded with 16 grams of organic protein, organic complex carbohydrates from brown rice, organic spinach, kale, beets, tomatoes carrots, blueberry, banana, acai, apple, raspberry, organic green tea, organic pomegranate extracts along with 24 vitamins and minerals. 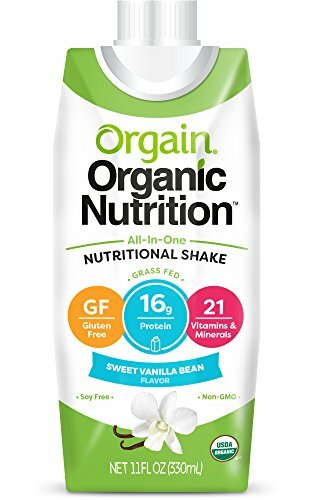 If that wasn’t enough, Orgain has the antioxidant equivalent (ORAC value) of 10 servings of fruits and vegetables and tastes incredibly delicious. Orgain has absolutely no caffeine, preservatives, gluten, saturated fat, hormones or antibiotics. Perfect for an organic meal on-the-go, a replenishing post-workout protein shake, extra nourishment, or a complete meal replacement for those looking to reach their weight loss goals organically.